Where to find the best organic meat in Los Angeles, CA? Shop online from the comfort of your home and have organic meat like grass fed beef, free range organic chicken, wild caught seafood and more delivered to your door. Shipping rates are very affordable in Los Angeles, for example, a $200 order can ship for around $25. And we pack your items in a cooler with plenty of dry ice to keep everything frozen – it’s only 1 day in transit from Topline Foods to your door. We never ship without confirming by email that someone will be able to bring the package in by the end of the day, too! So, you don’t have to worry – your organic meat will arrive safely and perfectly frozen. Why is choosing organic meat so important? Organic meat excludes the use of GMO ingredients in addition to disallowing antibiotics, added hormones, herbicides, pesticides and other chemicals like growth promotants. All these are bad for your health. In addition, animals raised in factory farm conditions receiving daily rations of antibiotics is the main cause of growing antibiotic resistant strains of bacteria in the world. This may be the biggest challenge facing the world today and one way to help is to avoid eating meats that have been treated with antibiotics. You can learn more about organic meat here. Organic grass fed meat is more expensive, how can I make it more affordable? Yes, organic meat is more expensive everywhere, even in Los Angeles! The reason for this is that grass fed organic meat is raised without antibiotics or growth promotants and entirely on grasses. This makes the cattle take longer to reach harvest weight and time, as we know, is money. It takes more labor and attention from the farmers as well. 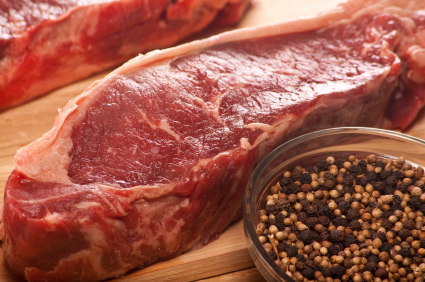 Shipping organic meat to Los Angeles is more affordable when you order in larger volume. An order of $200 will only be a few more dollars in shipping than a $50 order. Most orders in the $200 range will only be about $25 to ship. This is because there are certain fixed costs associated with shipping everywhere, including Los Angeles, CA. Take advantage of bulk discounts. We offer bulk discounts on most of our popular organic meat items like organic grass fed steaks, antibiotic free chicken and wild caught seafood. Just click on an item on the website to see if a bulk discount is offered and what the qualifying quantity is for that item, usually 6-10 pieces. Every time you place an order for organic foods over $99 we keep track. After your 5th order over $99 we’ll send you a coupon for 10% off your 6th order. You don’t have to do a thing, we’ll track and reward you automatically! We also offer Referral Rewards. You can enter your email here to receive a coupon code that you can share with friends and family that will give them $10 off their first order. Ask them to put your name in the “special instructions” box at checkout and we’ll reward you with $10 store credit! There is no limit to how many Referral Rewards you can receive! You can also sign up for our weekly emails with special offers, sales and restocked or new item announcements. We won’t spam you and your email will never be given or sold to anyone else. You can also opt out at any time with the link at the bottom of each email. Learn more about all these rewards and sign up for our emails and the coupon for your friends here. Organic meat is better for you, your family and the world. Shopping online in Los Angeles, CA is quick and easy and we ship to your door! This entry was written by Jeff, posted on December 17, 2013 at 4:53 pm, filed under Announcements - Cities, Blog and tagged beef, CA, California, grass fed, Los Angeles, meat, organic, organic meat. Bookmark the permalink. Follow any comments here with the RSS feed for this post. Both comments and trackbacks are currently closed.